Does the United States Postal Service discriminate against atheists? A recent experiment suggests it does. 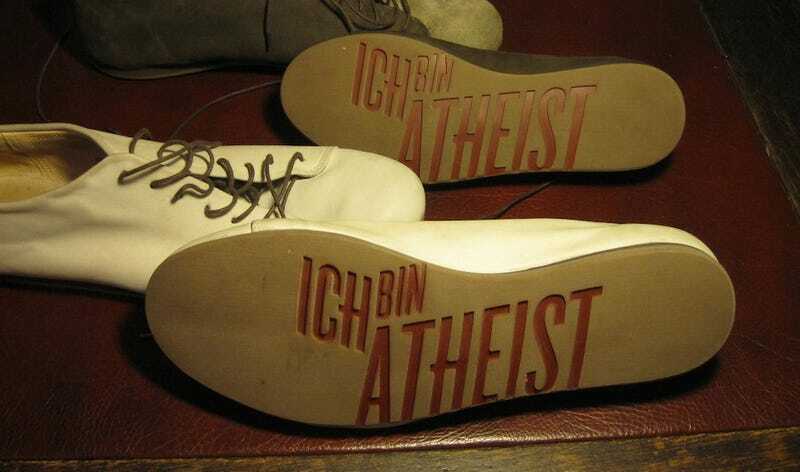 ATHEIST SHOES is a German based-company that, as its name suggests, makes comfy kicks "for people who don't believe in god(s)." The company regularly ships shoes, like the ones pictured above, to America. When it does, it seals its boxes with tape featuring the company logo, which is stylized as "ATHEIST · ATHEIST · ATHEIST" (see below). But these shipments often run into problems. The company explains on its website that shoes shipped the U.S. often take longer than they should to arrive, or go missing altogether. "When some of our customers asked us not to use ATHEIST-branded packing tape on their shipments, we started to wonder if the delays were caused by the US Postal Service taking offence at our overt godlessness." "So," the company writes, "we launched an experiment." Said experiment, which is recounted in detail in an infographic on the company's website, saw 178 packages shipped to 89 people in 49 U.S. States. All packages left Berlin on the same day, and each person was sent two packages. The first was sealed with ATHEIST tape, the second with neutral tape. The result? Boxes sealed with ATHEIST tape were ten-times more likely to go missing, and took an average of three days longer to arrive than neutral-wrapped packages. "Having run a series of control tests in Germany and Europe, which demonstrate no such bias," the company writes, "the problem appears to be in the USA and is likely explained by the differential handling of packages by the employees of the US Postal Service." An unsettling find – remember, mail-tampering is a federal offense. While it wasn't the most rigorous experiment, the company's results did demonstrate statistical significance. Consequently, ATHEIST SHOES has stopped using ATHEIST packing tape on American shipments. Apparently, delivery times are already improving. Read the details surrounding the experiment on the company's website.